Shanghai Blu-ray Review. ... all in all Shanghai has plenty to offer fans of espionage dramas and its stellar cast likewise seem to revel in this inimitable city’s shadowy underbelly. Though it underwent numerous indignities in pre-production and failed to garner either an American theatrical release or anything approaching its reported $50 million budget, Shanghai, the second collaboration between John Cusack and director Mikael Håfström after 1408, is nonetheless a hard-working and stylishly evinced period drama that deserves its chance to finally be seen. 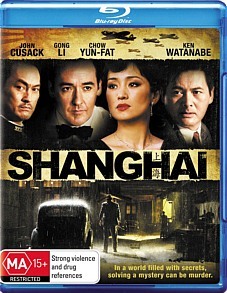 Bolstered by some strong performances from its first rate ensemble case, this atmospheric outing sees Cusack starring as Agent Paul Soames, a Naval Intelligence Officer who returns to lawless, Japanese-occupied Shanghai shortly before the attack on Pearl Harbour. While investigating the suspicious death of a military buddy he captures the respective attentions of an organised crime boss (Chow Yun-fat), his beautiful but duplicitous wife (Gong Li) and Japanese army kingpin Captain Tanaka (Ken Watanabe, Inception). Several murders and no small number of martinis later and it will be all Soames can do to escape the city with his life, let alone anything approximating an understanding of the Shanghai underworld and its nefarious goings-on. Retaining distinct elements of noir and incorporating a number of plot convolutions (of admittedly variable efficacy), Shanghai pulls out all the stops in its attempts to keep you guessing. Its 1940s locale is deftly evinced by a combination of CGI and cleverly constructed sets, the costuming and cinematography are excellent and the performances, as mentioned, sublime, particularly that of Gong Li and the ever-impressive Watanabe, who pulls off yet another nuanced and morally ambiguous leading character with impeccable aplomb. Picture and sound quality on the BD edition are likewise superb, though there is an unfortunate dearth of bonus content - all in all Shanghai has plenty to offer fans of espionage dramas and its stellar cast likewise seem to revel in this inimitable city’s shadowy underbelly.